Woodlink's cedar wren and chickadee house is ornithologically designed to attract these species. The house features and easy open side to make cleaning easy. The green painted roof and etched design front make this house even more attractive. The 1/8th-inch hole is ideal for wrens and chickadees. The house is constructed of reforested, kiln dried, inland red cedar and screws. 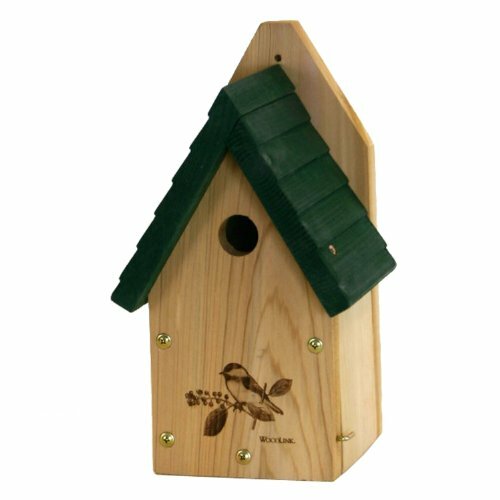 The birdhouse is predrilled for easy mounting with screws which are included. Made in the USA. If you have any questions about this product by Woodlink, contact us by completing and submitting the form below. If you are looking for a specif part number, please include it with your message.